Christmas calendar : How many days till Christmas? How many days till Christmas? Children come up with this question many times during the month of December and this impatience is part of the reason why children would love to have a Christmas calendar. On this site, we offer a Christmas calendar which can be opened with one mouse click on the window. Each window hides a picture. But remember that you are not allowed to cheat! If you would prefer to give your children a real Advent calendar / christmas calender then you should try a gift calendar which contains small gifts. But keep in mind that the gifts don’t have to be expensive. The surprise and joy of opening the gift is often most important for children. 1. Cut out an oblong piece of cloth approximately 1 ½ meters long and 25 centimeters wide. 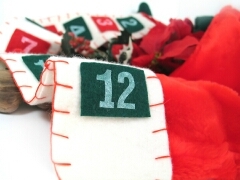 Embroider small Christmas characters on the cloth and attach 24 small curtain rings for hanging gifts. 2. Gather 24 cardboard toilet paper tubes. Arrange and glue them horizontally to form a pyramid-shape. Cover the toilet paper tube pyramid with cloth and place small angles to complete the pyramid effect. The hole in each of the rolls is used for hiding a gift. 3. Collect 24 big matchboxes and glue them together on top of each other. Decorate with clothing and angels. Each matchbox now serves as a small drawer for hiding a gift in the christmas calender. When you make a Christmas calendar for your children, you carry on an old tradition at the same time.